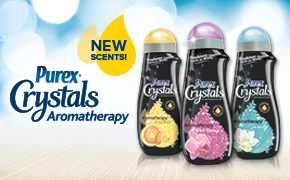 Purex Crystals Aromatherapy is available in 3 magnificent scents, which will eliminate laundry odors and boost your mood. Well Being brightens any mood with the happy fragrance of fresh blossoms. Energy helps you tackle any day with the stimulating power of citrus. Serenity keeps you calm all day long with the gentle scent of water-lilies. Add Purex Crystals Aromatherapy into your washer’s tub (top, front-loading, or HE) at the start of the wash and it works with your laundry detergent. This allows the crystals to infuse your clothing with a scent that lasts for weeks, not days. I have been using the crystals (Well Being Scent) for a few weeks now and I am impressed in how it works. My clothes smell fresh and clean even after sitting in the closet for over a week. The product worked great even if I added less to each load. I was afraid that the crystals may damage some clothing but that was not the case. The Purex corporation provided me with a free sample of the product for my honest review and I was not compensated for my review.